So far I have found only one brave attempt to interpret the Pictish symbols. This is immediately a rather uncommon interpretation though. 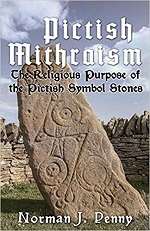 The website is called “Pictish Mithraism” which also tells you in what direction the interpretations go. The author argues against several of the standing hypothesis, both the symbolic and the historic ones. The biggest merit of the website is that the author categorises the symbols and tells his readers how he came to his interpretations. Forbes presents a whole new approach to the elusive Pictish symbols. The title of the book gives away that the author is of the opinion that the Picts were a Celtic people. This is not the most eyecatching hypothesis of this book though. The author found the so-called “hunting scene” on the Shandwick stone (not the one of the cover, this is the Hilton of Cadboll Stone that is displayed in the museum of Scotland in Edinburgh) looking somewhat odd. He goes at great length to show that the strange arrangement of characters refer to stars and constellations that appear in a period of time at sunrise, ‘peaking’ at Midwinter. Thus the author discovered that the Picts had an interest in astronomy or astrology and were well acquainted with the night sky. The theory looks a bit forced since Forbes has to reckon that the Pictish astronomical system was not entirely like ours. His findings are quite striking nonetheless. Then the author goes on to other symbol stones to test his theory. He comes to original conclusions and perhaps most striking is that a lot of gaps and questions can be answered by looking at Hindu astrology. When a picturing of a star and constellations seems rather off compared to what we know, Hindus appear to have to come similar conclusions. Even the strange “Pictish beast” has an Indian counterpart in the Makara. So what about the abstract symbols then? Forbes also connects these to stars and (parts of) constellations and here these connections are even less obvious than with the more recognisable images. He does come with some noteworthy thoughts on the rods, mirrors, combs and the like. His conclusion is that the Pictish stone are markers that refer to specific dates by showing the position of (mostly) two stars or constellations. This can also help to date the stones. I find these conclusions not always convincing, but this is certainly a new approach that needs further investigation. Forbes continue to work out his theories at LastOfTheDruids.com. There you can also get an idea of the book of course.